In Clear’s Silat Phase 1 we have a class to specifically work on Waist power, Knee power and whole body power. Waist power is often mentioned in many sports and physical disciplines and I find that most students have had some exposure to the concept and principle of waist power. However, I also find that most people do not “physically” know the difference between moving the waist and turning the hips. To the untrained eye, for waist power, turning the waist and turning the hips appears to be the same thing. But, these two things are very different from each other. The hips are bones and part of the skeleton. The waist is primarily muscle. The ramifications of this are huge. The ability to physically turn the hips is quite a bit more limited than the ability to turn the waist and the range of motion of the waist is much larger than the range of motion for the hips. Also, using the hips for power over time actually damages the hips and in most people eventually over 20 – 30 years calls for a hip replacement surgery in order to fix the damage that has been done to the bone. Actual waist power has quite a different affect. Correctly training and using the waist for power builds the core muscles and is very healthy for the body as a result. One of the basic ways to differentiate between hip and waist motion is to stand with your feet at slightly wider than shoulder width, stand up tall with your legs locked or stand in a strong horse stance and practice turning your upper body 90 degrees to the left or right. Make sure that your hips stay facing the front. To exercise the waist muscles and to work on your range of motion turn 90 degrees or more back and forth to the left and right. Do not be alarmed by your breathing because when you do this correctly you will feel your diaphragm pumping up and down as you turn. For a comparison of waist power and no waist power try pushing a resisting partner or heavy object without using waist power and then push against the same resisting partner or heavy object while using waist power. There should be a noticeable difference. Also, try throwing a punch in the air without using waist power and then do the same punch using waist power then do it without using waist power one more time to get a good comparison. Another good comparison exercise for waist power is to have a strong partner grab you. 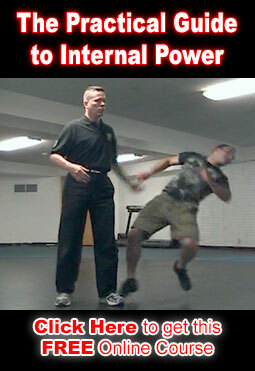 Try to pull your partner without using waist power and then try to pull them using your waist for power. Also, try to escape by pulling your arm away without using waist power then do the same thing again but primarily using your waist as the source for power. The waist is King! I do a series of Andrew Lum warm ups specifically designed to get the waist moving. Important information, thanks. The waist is definitely a major source of power as are the legs and the breath. You are most welcome.